Look what we picked up at brides.com!!!! The perfect centerpiece for your bridal shower or engagement party! It's called "Cupcake in Bloom" from 1-800-Flowers...isn't it darling??? 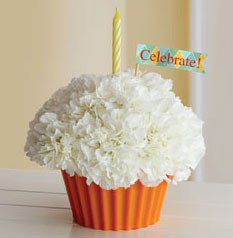 1-800-Flowers Cupcake in Bloom is 5" high x 6.5" deep and sells for $24.99 and they're available beginning October 1.